What is an Order Estimate? It’s an estimate of how much your first bill will be, and what your minimum monthly charge will be after that. Your first bill will have one-off charges, so it will be different to your subsequent bills. An order estimate shows you this in advance. It is NOT your bill. Why did I receive an Order Estimate? 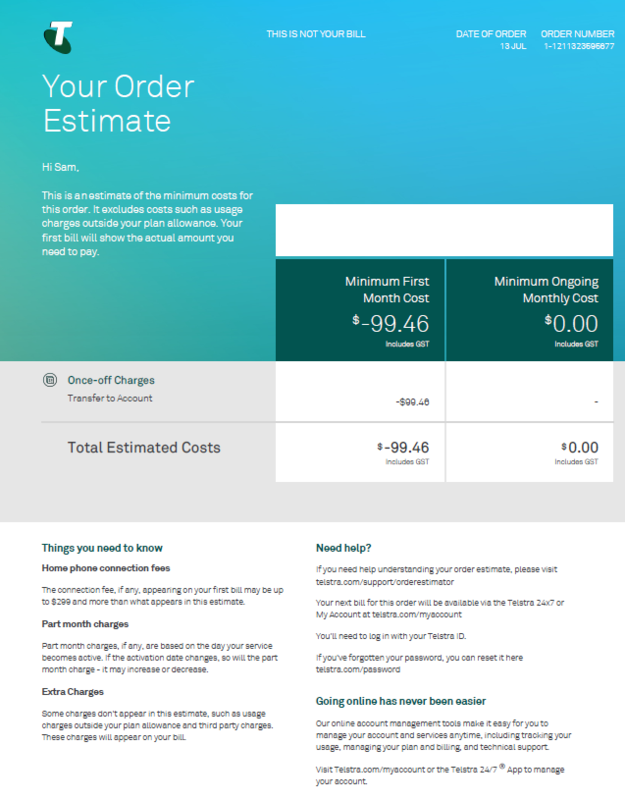 If you’re a new Telstra customer or an existing customer who has changed your service, we send you an Order Estimate so you know in advance what charges to expect on your first bill - and how your subsequent bills will be different. How close to my actual bill amount is this? The estimate should be relatively close to your first bill amount, but may vary slightly depending on what date your service is activated due to the pro-rata charges (part month charges). What if I have questions about the amounts on my Order Estimate? If you want more information about the charges estimate call us on 13 22 00. When will I receive my actual bill? The date your bill should be issued is at the top of page 2 of your Order Estimate, in the ‘Your order timeline’ section.